While channel surfing one night in December 2006 I came across the popular television program 'The Colbert Report' . I tuned in near the end of Stephen Colbert's interview with Daniel Pinchbeck; with the two of them discussing Daniel's then-latest book "2012 - The Return of Quetzalcoatl". Because of that interview I became interested enough in the book to purchase a copy and read it. Several weeks later I was discussing the book and its mention of 2012 and the Hopi prophecy with friend of mine. Out of this discussion came the suggestion that since I was so interested in the Hopi maybe I should take a trip to Arizona to go visit them. I replied that I had never been to Arizona, nor could I foresee any reason for ever having to go there. Then something strange happened. On the very next day my phone rings and it's Lee Weitzman calling from Chicago. Lee had a client in Tucson with a problem they needed help with on a custom dining table we had made a few years earlier. (Apparently a housekeeper had tried to clean the table with abrasive cleanser, and now someone was needed to explain to a local cabinet shop the process of repairing the finish). As much as I tried to explain the process over the phone the client was adamant that I travel to Arizona to deal with the matter personally. They had no qualms about paying for my time and travel expenses. As it turned out, for as much as I tried to talk my way out of making the trip because of how busy I was, it soon became clear that I would have little choice but to go. It was also now apparent that since I was travelling to Arizona anyway (thanks to a client willing to pay for the bulk of my travel expenses), there would be little in the way of added cost to extend my trip a few days for a personal side trip. That said, I decided to follow an intuitive hunch down the proverbial rabbit hole by planning a visit to the Hopi reservation as part of this trip. I flew to Arizona and managed to resolve the table problem by the morning of February 9th. As soon as I was done I made a beeline to Winslow, Arizona and then took a 4-wheel-drive north into the desert. 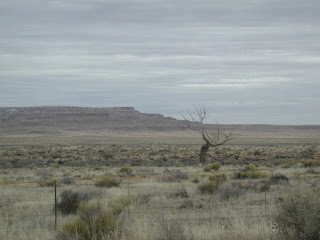 I was on the Hopi reservation by late afternoon. After driving around and orienting myself with the area I eventually found myself in one of the most traditional of Hopi villages. In so doing I also ended up having a chance meeting with the eldest elder of the Hopi - a revered individual by the name of Grandfather Martin Gashweseoma. Out of respect for Grandfather Martin and the Hopi people I will not give much detail on what happened during my visit. I was asked not to take any photographs or make any sketches in and around the village, and I respected those requests. The only photographs I took were outside of the village, and even those were taken with permission. It is my understanding that many Hopi feel that their way of life has been exploited and misrepresented by non-Hopi such as myself - and not without reason. Therefore, I prefer to err on the side of caution and will share my story based on my own personal experience with what unfolded. It was late in the afternoon of February 9th when I first met Grandfather Martin. He was busy gathering coal, and after a brief discussion he offered to let me stay the night in his home. I thanked him for the offer, but not wanting to impose on his generosity I said I'd find a place off reservation and return the next day. "Be back before sunrise" he said. That night I could barely sleep. I had just met a man who many consider to be the Native American equivalent to the Dalai Lama, and he had just welcomed me into his village. Not wanting to be late, or delayed for any reason, I checked out of my hotel by 3:00 a.m. and drove back to the reservation, where I parked on the side of the road outside the village to wait for the dawn. Because this area is so remote, and there is absolutely no electricity or street lights (or streets for that matter) within the village itself, the darkness at night is more than palpable. It was literally and figuratively pitch black. At some point a very faint glow of light began to appear on the distant horizon, and I knew that dawn was approaching. Not knowing the exact time of sunrise, and not wanting to be late, I set out on foot to make my way into the village. I used my memory of curves and laneways from the previous day to guide me to the main plaza - alongside of which Grandfather Martin's home was located. It felt strange to be a white man walking gingerly through the darkness of a Hopi village. On some level I felt like an intruder. As I got within yards of Grandfather Martin's door I heard growls and something suddenly rushing at me out of the darkness. I didn't know what it was or where it was coming from until it was right upon me. Rez dogs - two of them. At first I thought they were attacking me, but thankfully they didn't. I was then concerned that they'd start barking and waking the whole village, so to keep them quiet I started rubbing and petting the sides of their necks. Thankfully that worked because they loved the attention - so much so that they ended up coiling themselves so tightly around my legs so that now I couldn't walk anywhere. So there I stood in the pre-dawn darkness - about 10 feet from Grandfather Martin's door - hunched over and scratching the necks of 2 feral dogs who were determined to keep me standing where I was. I didn't dare stop rubbing their necks either, because at least what I was doing was keeping them quiet. There was no light or noise coming from inside the home, so I also had no idea how much longer I'd have to wait. After a long while the door opened, and Grandfather Martin peered outside. Seeing me there he beckoned for me to come inside. The dogs, it turned out, were his and he seemed pleased that they liked me. What I soon discovered was that I had unexpectedly shown up on one of the most sacred days on the Hopi calendar. Known as Powamuya, this is a time of purification that culminates with a ceremony known as the bean dance. To describe it in simple terms: this celebration marks the return of the katsinam, who are the benevolent spirit beings who live among the Hopi for about a six month period each year. In broader terms, and to use a sports analogy, it was as if I had shown up at a football stadium and discovered, quite by chance, that the Super Bowl was being played there that day. The fact that I was welcomed and invited into this elder's home was the equivalent of receiving sideline passes to the 50 yard line. The experience was magical beyond comprehension. Grandfather Martin's home faces a main plaza, and as the day unfolded the bulk of the activity going on in the village was happening right out front. Inside the home was like a veritable Grand Central Station, with an ongoing feast and an endless stream of family and friends constantly coming and going. By far the most pleasantly haunting and treasured of memories of that experience were the sights and sounds of the costumed Kachina dancers as they emerged from the underground kivas to slowly dance and weave their way down the dirt lane ways and into the central plaza. It gave me chills of awe to bear witness to ceremony that was probably the same as it has been for thousands of years. I still get goose bumps every time I recall the memory. But what impressed me and influenced me the most were the Hopi people themselves. As a stranger and a white man I had shown up unannounced in their village on one of their most sacred of days. Instead of being turned away I was treated as a welcomed guest. Although the material means of the Hopi were few, what little was there was shared generously. The laughter and sense of humour amongst the Hopi was also a joy to behold, even though some of the loudest of laughs came at my own expense over what a Kachina dancer had done to my leg earlier in the day. Given how busy things were with ceremonies etc I had very little opportunity to talk one on one with Grandfather Martin, although he did ask me to sit with him a few times while the dances were taking place. During these times he said very little, but from looking into his eyes I could sense within him a profound, intuitive sense of "knowing" - almost as if there was a form of telepathic dialogue going on between us that I was not consciously aware of. It would be no understatement to say that this is a guy who can truly read people like a book. 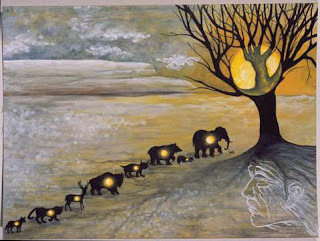 Although this is difficult to prove or articulate I believe that people such as Grandfather Martin and other indigenous peoples such as the traditional Hopi are some of the last remaining people on this planet who retain a true sense of spiritual connectedness to the planet and the natural world. They have a sense of profound wisdom, as opposed to one of knowledge alone. Compare this painting to the photograph I took, with permission, while on the Hopi reservation (near the village of Kykotsmovi) on February 10, 2007 - the day of the bean dance. The resemblance between the two is rather remarkable. What does it mean? Who knows - most people might say it's nothing more than a coincidence. Maybe so. But if it's a coincidence, it's a pretty good one. My feeling is that at some point in our respective lives each and every one of us gets confronted with an unusual circumstance or "coincidence" to remind us that the world is not as it seems and maybe, just maybe, it's prudent to listen to our intuition as opposed to blindly obeying what the talking heads on television tell us to think and do. 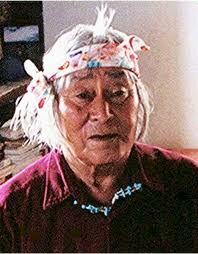 What I am certain of is that traditional indigenous elders such as Grandfather Martin of the Hopi are some of the wisest people left on this planet. They are connected to a level of understanding that very few of us can comprehend. As such they are well aware of the change, turmoil and uncertainty going on in the world today, especially since much of it has already been accurately foretold in things like their ancient prophecies. Grandfather Martin, for example, was foretelling of planes flying into the Twin Towers five years before it happened. But his words were all but ignored, largely because there were many who simply dismissed him as some kind of crazy Indian living in the desert. must go back and tell the people that this is the Hour. Then he clasped his hands together, smiled, and said, This could be a good time! we are to take nothing personally, least of all ourselves. и съм пре_открил и колко е корен квдратен от "пи"
задача нерешима от векове за най-големите Човешки умове! а след 7 _та минута Той Съзерцавал Творението си.. If anyone knows Bulgarian, perhaps they can translate. I circulated the river has its destination many years ago in a mass mailing to friends and family. I decorated the page so that they might be inclined to post it and share with others--each was a work of art. It's come full circle again. THank you.